Q. Does the slot in the Sarca’s shank always allow it to be retrieved from reef? A No, the slot simply gives you the best chance of retrieving the Sarca, if you drop any anchor design into a hole such as an old tyre reef, no method of anchor retrieval would be successful in a situation such as that. Q. Will the trip release trip if I should drift over the anchor? A No chance, it is impossible for the Sarca to drag rear ward because of it’s wedge design, if you should break it free it will simply roll over and reset itself with in the distance of its fluke plate, you have to be directly above the anchor pulling upward to trip the Super Sarca and even then once broken free it will automatically reset, Super Sarca is the only anchor on the market with a patented automatic reset trip mechanism. Q. I have a Rocna anchor and my mate has a Manson Supreme, they look similar to your Super Sarca, my Rocna works better than my old plough but like the Manson Supreme if comes up chocked full of mud, will the Sarca do the same ? A No – Super Sarca is of convex design, Rocna and Manson Supreme is of concave design, concave design has been used for many years for sinking Dams as their digging buckets are also of concave design to lift the mud out. Super Sarca being convex simply drops the lot on retrieval as there is no where for the mud to hang on, further aiding the dispersal of mud is the innovative and strategically placed slots in Sarca’s fluke plate. Just a small experiment, drop a tennis ball into a concave design and it will stay there, impossible to drop a tennis ball into a convex. Q. If I were to cut slots in the fluke plate of my Rocna would that help to disperse the mud? A Un fortunately because your anchor is of concave design the cutting of slots in its fluke plate will have little to no significance as in dispersing of mud and because of Rocna’s design cutting slots could weaken its structure. Q. Will the Super Sarca hold in multiple sea beds? 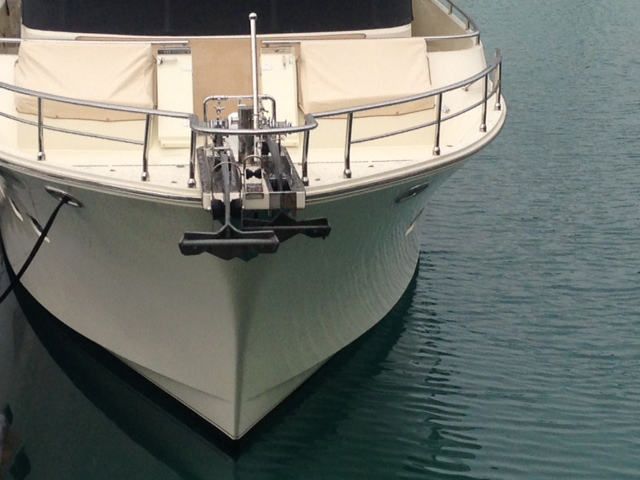 A The Super Sarca was purposely designed as a multi purpose anchor and has proven itself over since its launch in 1999 check the endorsements, Sarca saved lives in the Tsunami in Phuket. Q. Who was the first on the market with a hoop anchor design? A Bugel was first but did not enjoy a lot of success at the time, its performance was somewhat better than CQR and other similar brands, Anchor Right Australia was next but with a whole new concept of anchor technology, its success can be seen now in many facets of the marine industry and has become a household name. We believe that with the success of Sarca anchor manufacturers were inspired by Anchor Right to take the next step in anchor technology, as a result any anchor designed in the last six years is far better than the old generic style anchors that we have become to know. Q. Why does Sarca need a stainless D shackle? A Any slide rail arrangement that relies on the sliding action of the D shackle must be stainless, if you use a galvanized D Shackle it will stick as galvanizing will not allow a galvanized D shackle to slide correctly, stainless does not bite in and slides like a bearing. Further more take notice of how the D shackle is to be fitted to Super Sarca, The D shackle bolt must go through the slide rail, not the U shape of the shackle. Note: If you ignore these comments chances are your Sarca’s performance will be severely impaired. Please view the DVD for confirmation of these answers. Q. I am really confused, every anchor manufacture say they have the highest holding power anchor, yet every anchor test I view its always a different anchor design from the last test claiming the same. A A good Question, you should not read to much into an anchor test unless it is done by an independent anchor test authority and not the results from independent magazine tests. First lesson, any anchor test carried out with a tug boat incorporates many variables such as wave height, wind age, weight and length of cable, one of the largest uncontrollable contributors to variables is incorrect or inconsistency with applying load via the vessels throttle, these variables will give you a different reading every time you test an anchor. Anchor Right identified these problems many years back and set about developing a system that would give reproducible results time over again eliminating variables and delivering actual holding power results that the anchor design in question had to offer. Our holding power charts are the most accurate and reproducible figures world wide, how did we achieve this, TATS Tidal anchor test skid, Anchor Right with another world first. Check out this incredible test rig on the TATS page. Q. Hi Rex, can you explain a query I have from the Rocna’s web site, I was recently looking through fishing forums where Craig Smith from Rocna directs quite a bit of traffic to a link he has on Rocna’s knowledge base, this link clearly shows a Sarca anchor with the D Shackle jammed in a Voile French Mag published some time ago, this obviously doesn’t happen too often as I have read many great reviews on your Sarca boat anchor, my question is how often could it happen and is there a way of avoiding it as I am thinking of purchasing one of your anchors? A Yes you are quite right about Craig Smiths Link, the D Shackle is certainly jammed, I do not know who was responsible for this. There are three major defects on this link directed to the D shackle, If you zoom up the last photo on the link you will see clearly the D shackle is not of stainless steel as Anchor Right Australia recommend, Stainless slides Like a bearing, Galvanized D shackles tend to stick when used in the configuration of our trip release. Secondly you will see the D shackle is fitted with the bend of the shackle through the slide rail, this will allow the chain to jam on one side of the shackle impairing the anchors performance, all of our instructions clearly show the screw pin of the D shackle located through the slide rail of all Sarca anchors. And third, when you zoom up the last photo of this subject you will clearly see the D shackle, is fitted to the underside of the anchors shank rendering the anchor incapable of working, now if someone is going to test an anchor they do their homework so as to understand the principle of design, you could excuse them getting some things wrong but all three? To be sure they could have simply looked at our web site, I have emailed Craig several times bringing the above to his attention on Rocna’s knowledge base and unfortunately he has not obliged to remove it, this is a concern to Anchor Right as it could be confusing for customers such as your self, difference being you have asked the question, some may not, finally I say to you if our anchor performed that badly then how did they survive on Sarca anchors during the Tsunami that hit Phuket, read review on testimonials. Q. Sarca Excel looks similar to a delta style or plough anchor, why is the holding power so much greater? A Take a second look, Sarca Excel has a single rear plain fluke that doesn’t plough, this unique design compressors the substrate and forces it over its rear, incredible pressure is applied to the convex surface area of the Excel, when this happens these forces not only multiplies the anchors holding power but drives the anchor down filling in behind it. Excel also incorporates extended and slightly concave cutting edges. You will further notice the toe of the Excel is turned down also with extended cutting edges. The turn down of the toe allows the anchor to set in most cases within the length if its fluke, it has low resistance when penetrating and will readily bed itself in a wide variety of ocean type substrates, sand, mud, reef, gravel and many more. Q. 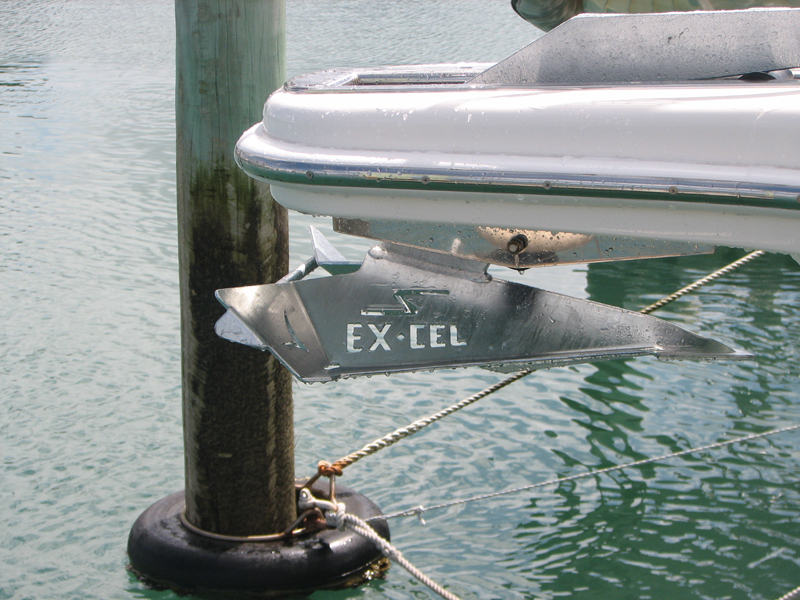 How does the Excel handle the change of tide, will it follow my boat around without breaking free and then dragging? A If the Excel is well buried chances are it will not break free in the change of tide, but make no mistake, regardless of anchor design they can all be broken free in conditions that are unpredictable, the important factor here is should the anchor break free will it reset. This is where your old style anchors really struggle but the new technology incorporated in the Excel will give you the best chance of not breaking free, should the Excel break free it will in most cases reset rapidly due to the information supplied above. Q. Are you stating that the Excel is the perfect anchor? 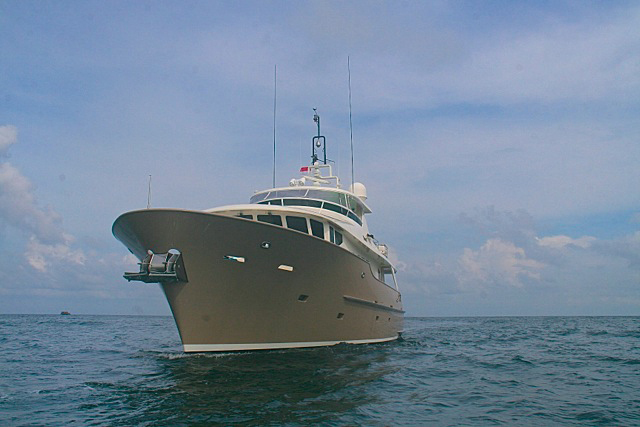 A A dangerous thought, if any company was to say you were buying the perfect anchor then beware, there is no such thing as the perfect anchor but certainly there are better ones, I believe strongly that our anchors are the best, that’s why we have a satisfaction money back guarantee. Q. I have a new generation concave hoop style anchor, it certainly performs far better than my previous delta, but with this new concave design I now have another set of problems. I have a pull pit anchor housing arrangement, that is the anchor comes up through a slot, the hoop on the new generation anchor will not allow the anchor to come through the slot and it really looks unsightly, now I could live with this but there are other problems, in most cases this new anchor of mine comes up full of mud, the mud sometimes is so compressed it will not budge unless I scrap it of, this is difficult in fact almost impossible to access as the anchor is under the bow, this problem is sometimes extended as when the anchor is really clogged I have to clean it before re launching other wise it drags. Will your Excel anchor solve my problems? A Anchor Right was responsible fore creating the second hoop style anchor ever design in 1992 so we have had a lot of experience with this design and can easily relate to problems you are experiencing, more info if you go to questions and answers on Super Sarca. The Excel will eliminate all of the problems that you have with your new generation hoop style anchor, to start with the Excel will fit just about any pull pit or bow roller anchor release and retrieval arrangement as it is of generic design such as Plough type, CQR, Delta excetra. Excel Doesn’t need a hoop as it is self righting and self aligning, Excel is of convex design not a mud bucket, to further aid the cleaning and setting of the anchor the very name Excel and where it is situated allows water to pass through when penetrating the ocean floor reducing resistance and marginally improving the anchors performance, yet upon retrieval the Excel name allows water to pass through these apertures alleviating the sticking and compressing of mud, end result a clean anchor on retrieval. 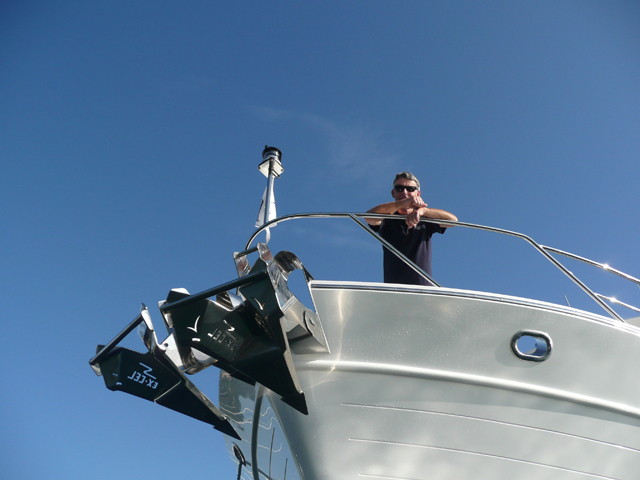 Q. I have had a number of sand anchors bend, will I have the sane problems with the Excel? A The Excel has the pulling shank and the cutting toe constructed of bisaloy 80, an extremely high tensile steel that has great flexing properties. Further more its fluke plate is filled with molten cast steel Making the Excel a contender for one of the worlds strongest anchors.